See all 2 examples in "All"
A subject is a human figure, pet, house, or a complex background object that you want to include in your artwork. All of our printing paper or canvas are proudly made in USA. Premium Photo Paper(Semi-Gloss): Our premium luster paper is semi-gloss with 10 mil thickness for durable photographic feel and vivid color reproduction. Deluxe Cotton Canvas: Our premium stretchable semi-gloss cotton canvas has natural textures, which gives the look and feel of a traditional painted masterpiece. Textured Fine Art Paper(Matte): Our textured fine art paper has heavyweight archival quality. With a matte finish and 100% acid free, it is ideal for fine art reproductions. Standard Digital Downloads: Approximately for 8"x10" print with a resolution of 150 pixels per inch. This size is ideal for small-scale printing, such as greeting cards. Hi-Def Digital Downloads: Approximately for 16"x20" print with a resolution of 300 pixels per inch. This size is ideal for larger-scale print projects, such as posters. Standard design time: (included) Your artwork will be created in approximately 3-4 business days upon receipt of your photo. Expedited design time: (with extra $10 fee) Your artwork will be created in 1 or 2 business days upon receipt of your photo. Elegant Matte Finish Our elegant matte paper has a textured linen finish and is the perfect choice if you want your invitations to have a classic, creamy finish. The elegant matte paper is generally reserved for couples looking for the classic invitation feel. This matte paper is 130lb with a 17pt thickness, and is FSC certified. Eco-Friendly Recycled Paper We know how important it is to take care of the environment, which is why we offer this bright white, 100% recycled paper. This paper also has a linen matte finish, and will make your invitation design look stunning. Being 130lb and 15pts thick, you can’t go wrong with this beautiful and sturdy finish made using the power of wind and water. Crystal Ice Finish This shimmery paper adds a stunning glow to each and every invitation. It has a subtle matte finish, and adds a crystal sparkle to your invitation design. This paper is 98lb and 15pts thick, and will leave all of your guests in awe. As always, this paper is FSC certified and environmentally friendly. Please review your personalized words on the left. Your image will fit inside the dashed lines. please contact us via email or phone. A subject is a human figure, pet, house, or a complex background object that you want to be included in the artwork. Configure your own size, frame options, and order additional prints. Note: Sizes are listed based on the number of subjects selected above. Changing the number of subjects above may change your custom pricing. Standard resolution downloads are approximately 8"x10" with a resolution of 150 pixels per inch. This size is ideal for small-scale printing, such as greeting cards or 8"x10" prints. High Resolution Download($45) High resolution downloads are approximately 16"x20" with a resolution of 300 pixels per inch. This size is ideal for larger-scale print projects, such as posters. Your artwork is printed on a single sheet of paper/canvers. Each panel is printed on a separate sheet of paper/canvas. Your artwork/printed photo will be rolled and packed in a heavy duty mailing tube very carefully to avoid creases. Your artwork/printed photo will be created in your selected size, and we'll leave extra white border for your own framing/mounting. Your artwork is printed on a single sheet of paper/canvas. FORE! 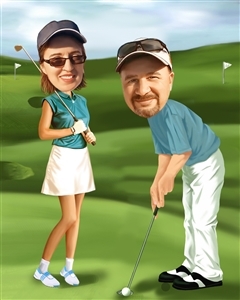 This golf caricature will remind your golfer that tee time is just around the corner! Your golf fanatic will surely love to show this artwork on his wall. All of our artists have a Bachelor of Arts degree, with over ten years of experience turning photos into beautiful art. 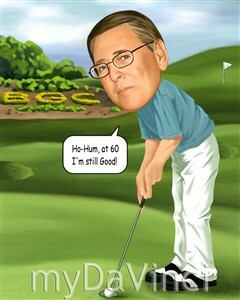 All of our pre-designed caricature templates are exclusively created by the myDaVinci artists. 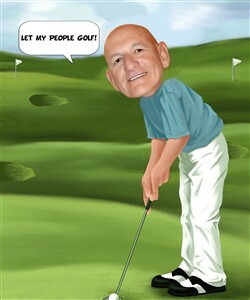 The latest 3D technology is used to digitally paint your faces into these caricature templates. We offer 400+ pre-designed caricature templates, and also the Custom Caricature from scratch. Request any changes after seeing the review and we will modify your artwork for FREE. We will refund 100% of your money if you don't love your artwork. Genuine Canon LUCIA EX ink products are used. These inks are known for their vibrant range of colors, scratch resistant surface, and exceptional color quality. All of our frames are made from recycled wood. Your artwork is printed, framed and inspected in our Chicago Art Studio, backed by our 100% money-back guarantee. For Continental US customers, FREE standard shipping over $149, or $12.95 otherwise. For all other states or countries delivery, there is a flat rate shipping charge $22.95. Extra shipping charge will apply to framed artwork. Expedited and rush options are available as well. We ordered this item to be presented at a major donors event and it the item was greatly received by the person we honored! Better than I expected and the person I gave the gift to really liked it. Can't find the right template? Have an idea but can't find the right template? No problem! With our Custom Cariactures, you share your vision and our talented artists take it from there! Are you a Do-it-yourselfer? Take this artwork into our DY Studio and let your creative juices flow. Choose from fundreds of styles, fonts, and stickers and create a truly unique artwork!